Pensioners and people in wheelchairs held up London traffic for almost an hour protesting at government cuts. Wheelchair users Sam Brackenbury and Daniel Estermann handcuffed themselves to the back of a double-decker bus in Oxford Circus. 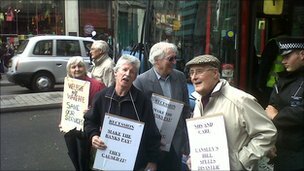 Members of the Greater London Pensioners' Association stood in front of the bus holding placards. They said they were "taking direct action" against cuts for the disabled and elderly. The eight demonstrators were eventually moved on by police, but not before drawing a supportive crowd of passers-by and causing a tailback of about 20 buses. Terry Hall, 76, handcuffed himself to the doors of the bus. "I have had cuts to my heating," he said. "The bus passes will probably be next. "At the end of the day, it's about real people." Mr Brackenbury said he did not yet know how the cuts would affect him. "I'm not protesting for my own benefit but for all the disabled people who will be affected," he said. Protesters said they had been brought together by communicating on social media. The administrator of the Facebook group Disability Defence, Howard Jones, who has cerebral palsy, lost his job as a graphic designer three years ago. "There is a lot of publicity that goes into talking about people who are on disability benefits being scroungers, but it is a smokescreen to get people off benefits to cut costs," he said. "I have 27 years of work experience but have not been even able to get an interview, despite applying for 176 jobs. What chance do these people stand?" A spokesperson for the Department for Work and Pensions said the government is committed to helping pensioners and the disabled. "We are reforming welfare to make sure that the billions we spend on benefits goes to those who need it and severely disabled people who need support will always get it," he said. "We have given the state pension a 'triple lock' so that it increases by the highest of earnings, prices or 2.5%, and we will reform the state pension to provide a system that is fairer and simpler for future pensioners."